HRD Strategies is proud to share that the Society for Human Resource Management (SHRM) has approved HRD Strategies to join their Preferred Provider network. 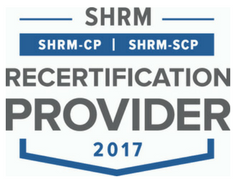 HRD Strategies is recognized by SHRM to offer Professional Development Credits (PDCs) for the SHRM-CPSM or SHRM-SCPSM. For more information about certification or recertification, please visit www.shrmcertification.org. For current HRD Strategies offerings, contact info@hrdstrategies.com.